Product Overview SilverStone created the Lucid series in an attempt to combine SilverStone’s traditionally excellent engineering quality with transparent or “lucid” aesthetics of glass-based exterior. 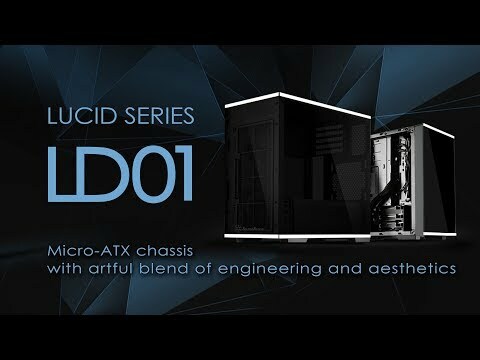 LD01, as the first Lucid series chassis, achieves this objective in splendid fashion. The striking exterior is covered in tempered glass flanked by functional stainless steel bands that not only adds a touch of premium feel but also protect the glass and simplify installation. With inverted motherboard tray design taken from the Temjin TJ08-E, one of the best Micro-ATX cases ever released, graphics or expansion cards installed into the LD01 can intake fresh air from above the chassis for vastly superior cooling compared with traditional layout that has the PSU & drive cage shroud limiting airflow. Another benefit of the inverted layout is that graphics card supporter will make contact only with graphics card's backside, thus eliminate potential interference with graphics card fans. Other notable features the LD01 has include front USB Type-C connector, quick access dust filter, smart backside cable routing, highly flexible space for installing all popular core components, and support for multiple cooling configurations. There are five total 120 / 140mm fan slots around the case with maximum radiator support at front, top, and rear. For those looking for a compact, beautiful glass design in Micro-ATX form factor without compromises, the LD01 is the clear and lucid choice. SilverStone Lucid LD01, Black, Mini Tower Chassis, Tempered Glass, MicroATX//Mini-ITX/DTX, 2x USB 3.0/1x USB3.1 is rated 5.0 out of 5 by 2. Rated 5 out of 5 by Chrisrkilv from Worth the money... I have built with many cases over the years, this one beats them all. I got this on promotion for £60, the price has actually risen above the original £80 since then but it is well worth it. The build quality is excellent, the blackout tempered glass looks amazing especially with RGB. I like the inverted design also, I need this due to my PC being on the left side of my desk but I actually prefer it regardless. Scan even refunded me my postage due to the shipping being late. Fantastic product, excellent service. Rated 5 out of 5 by Steve149 from Very nice - great build quality and size. I had three goes at building this and had to buy more bits so I thought I would pass on some advice. Firstly because all the sides are glass you are going to need a lot of fans. I have six RGB fans with an RGB controller and that adds up to 17 internal cables before starting on anything else. Just as well the case has very good cable management built in. I started with an mITX board but it didn't have enough headers so I am now using a MSI Z390M Edge which is a great board. I needed most of the board headers (2xUSB3, 2xUSB2 and 3xPWM fan headers). On the photo the case looks very nice (no visible cables) and is silent with the fans at 700 rpm during emails etc. On the photo you can read the Afterburner display. Far Cry 5 at 3440x1440 on Ultra with 100fps and the temperatures are in the 60-70 range (in a 22 deg. room). So pretty and effective! I tried mounting the front fans in front of the steel case frame (as some pro reviewers have) for better RGB visuals but you can't get enough air to the front fans like that and the CPU temperature gets much higher. The two intake fans in the top are also important for GPU temperatures. I might swap out the Cryorig H5 cooler (which is from a previous build) for something bigger (perhaps the Dark Rock Pro 4 with an RGB fan on the front) to get those CPU temperatures down another few degrees but it all works fine as it is.